The "MSC Monterey" is now en route to Boston after repairs were completed in Newfoundland. 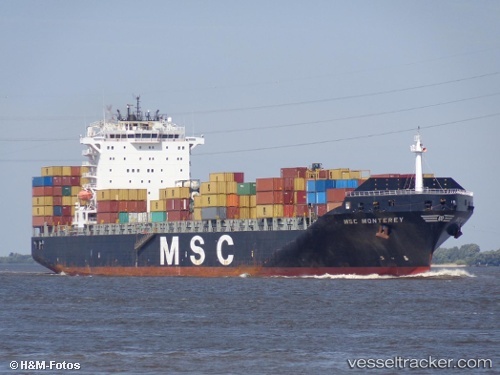 Experts of the Canadian Transportation Agency and from German Lloyd as well as representatives of a yard, insurance, chartering and shipping company NSB have been aboard the "MSC Monterey" on Jan 2 and it has now been decided that the ship must not enter a shipyard for repairs. The German Lloyd in collaboration with all parties involved decided that the repair of the damage can be carried out on site so there would be no need of a temporary repair and subsequent shipyard stay. Analyses of the tests performed led to the decision to drop the originally planned temporary repair. A carefully specified welding procedure has been defined by GL. More ultrasound tests which included not only the damaged areas were still to be carried out, but bad weather at the coast of Newfoundland with temperatures well below 0 ° C made repair difficult as it was impossible to preheat the steel and get the right temperature and observe cooling speeds accurately. The repairs will likely last seven days. A representative of German Lloyd must constantly supervise the work on site. After the repair the "MSC Monterey" probably will resume its travel on Jan 11. All the required repairs to the "MSC Monterey" were to be carried out on site in St. Mary's Bay starting this weekend. Until the completion of repairs the vessel stayed anchored at a sheltered location in the bay in the south of Newfoundland. The crack on the main deck and the outer hull was unchanged. It measured 1.5 meters on the main deck and extended for approximately 30 centimeters into the outer hull. After inspection of the crack on the main deck and the outer hull and comprehensive ultrasonic testings all experts considered the cause of the crack to be a defect welding seam. Adverse weather conditions at the coast of Newfoundland of currently below 0 C made repair procedures somewhat difficult. Repairs were being carried out by a Canadian expert company with great experience in this field and will probably take seven days. A representative of Germanischer Lloyd was to supervise works on site. The ship was to enter a repair yard only after it has reached Boston and offloaded the containers on board. After completion of works the vessel was to continue her voyage as part of her charter for MSC probably on January 11, 2014.